Savorbang is a regular recipe column based on the cooking blog of the same name by local stand-up comedian and teacher, Sarah Whitmore. For this latest installment, Sarah puts her unique spin on the winter comfort food superstar known as beet pie. Starbucks served an actual pumpkin latte? Barista: Pumpkin Spice Latte for Step-Angel! Customer: (handing cup back) You accidentally gave me a cup of . . . composting vegetables? A wet doll wig? And my name is just—Stephanie. Barista: (looks in cup) Nope, that’s a Pumpkin Spice Latte in there, like you ordered. Says here your name is Step-Angel so . . . anyway, no returns on drinks. Customer: I did not ask for this cup of wet pumpkin with the seeds and strings, bits of shell . . .
Barista: Actually, Step-Angel, you did. Don’t even get me started on pumpkin pie. Encyclopedia Voice: The Pilgrims used pumpkins to their great nutritional advantage. It is said pumpkin pie originated as a nourishing treat with these fine people. Oh please, we’re listening to the pilgrims about desserts? The culinary genius pilgrims? The famous-for-their-meat-porridge pilgrims? Why not switch it up this holiday season by ditching pumpkins? I’ll say it: Beet and carrot pies are better than pumpkin. Carrot pie is creamier, sweeter, and more buttery. Beet pie is so punk-rock-delicious, your uncle will tear holes in his khakis at the dinner table and spike his comb-over with gravy. The sweet earthiness of beets is pitched to nirvana levels with the cardamom. And the color! Beet pie is gorgeous. CARROTS. IT’S JUST CARROTS, YOU GUYS! •Make your favorite pie crust from scratch, or be like me, and scratch up a few bucks to buy a good pre-made crust. I combine two pre-made crusts and use one-and-one-half crusts for the shell. Leftover dough is made into adorable crust cookies to hide the ugly spots on the pie. •Peel and chop six medium sized carrots or six medium sized beets. Put in a pot with water to cover and add a dash of vanilla. Boil for 15 to 20 minutes until very soft. Drain and pat dry. •You can use canned beets but the pie will be lighter in color. 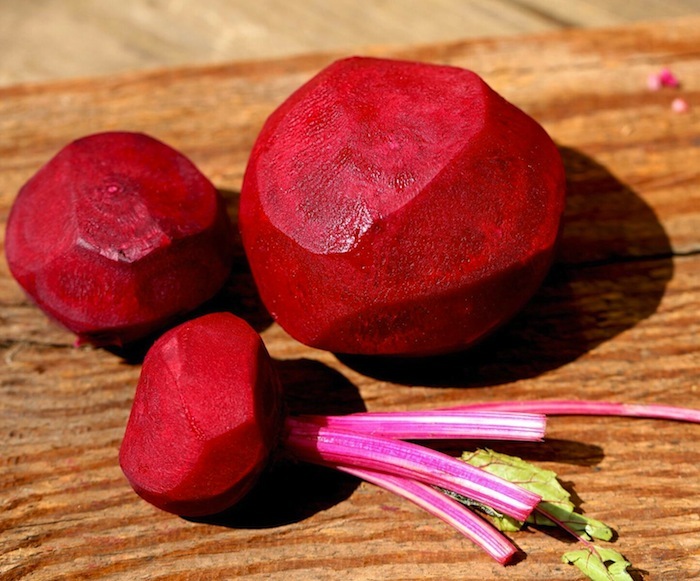 Roasting the beets will bring a deeper color and flavor. Add a teaspoon of water or increase the cream if using roasted vegetables. I suggest getting beets from Tara Firma Farms in Petaluma because you will feel like a virtuous homesteader/Hollywood billionaire. •You want to end up with two cups softcooked, mushy carrots or beets. Err on the side of surplus. 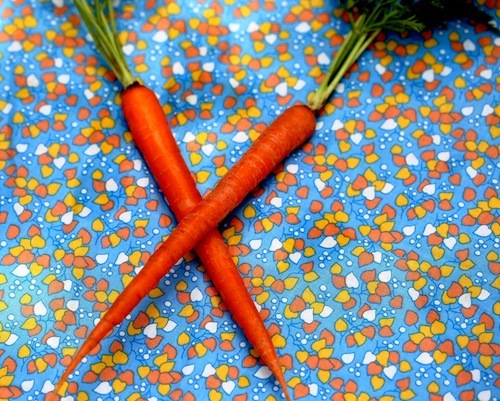 You can give any leftover soft vegetables to your landlord for X-mas. •Place two cups cooked carrots or beets in a food processor with one egg and three egg yolks, one cup sugar, one tsp vanilla, and . tsp salt. •For beet pie, add one teaspoon ground cardamom. 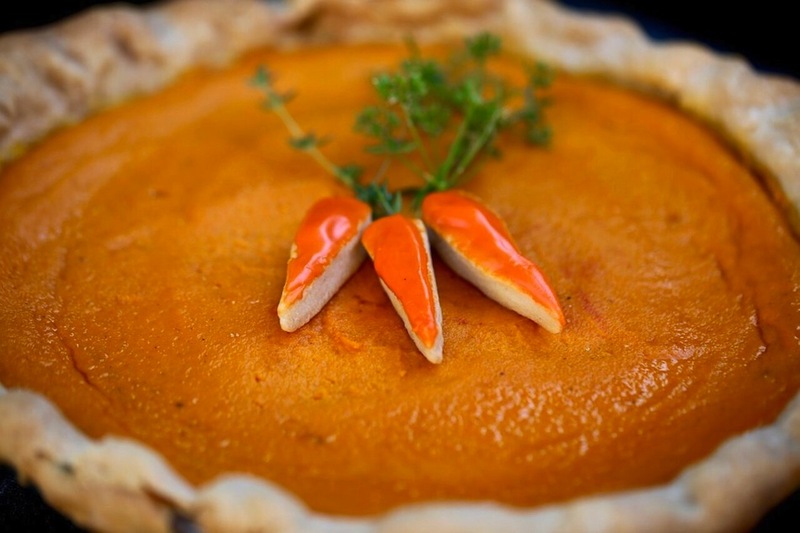 •For carrot pie add one tablespoon melted butter, ½ teaspoon each: ground cinnamon, nutmeg, and ginger, plus 1/4 teaspoon ground cloves. •Add one cup heavy cream. Blend five to 15 seconds until well-mixed but not churned to butter. •Pour mix into pie crust. Bake 50 minutes, or until pie is firm almost to the center, but jiggles slightly. Pie will firm up as it cools. 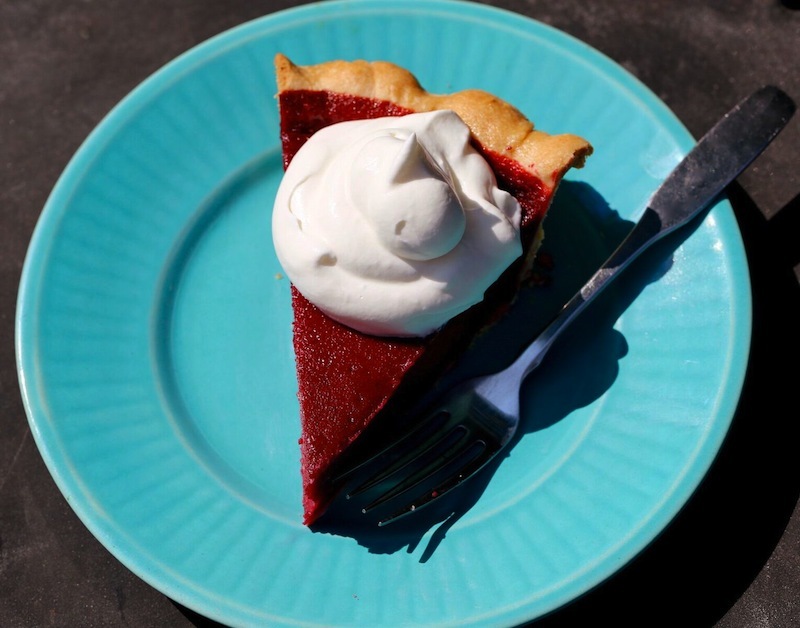 Place room temperature pie in refrigerator to finish setting for about an hour. •Serve topped with whipped cream or if you are a real food-dork, serve with a dollop of the following mix: Four tablespoons soft, mild goat cheese, 1/2 cup heavy whipping cream, ½ teaspoon vanilla, one teaspoon honey, 1/2 teaspoon dried ginger (for carrot pie) or cardamom (for beet pie). Blend or mix well with a fork.